What a change! The atmosphere across the northern hemisphere is going to undergo a major transformation as winter finally appears ready to arrive. The current pattern (which has been remarkably persistent) features low heights over Alaska, the Gulf of Alaska, the Bering Strait, and Kamchatka. This +EPO pattern is essentially flooding the United States with mild Pacific air. In addition the Arctic Oscillation has been strongly positive since October but is finally falling to near neutral numbers. You can see the changes over the North Pole over the last 7 days. 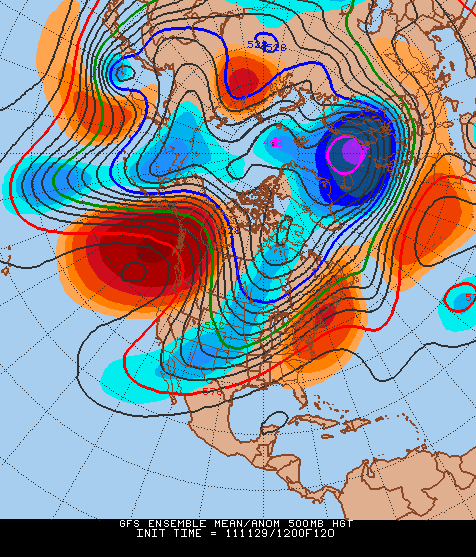 Here’s a look at 500mb height anomalies from 1/1/12 across the northern hemisphere. You can see the negative height anomalies over the North Pole and across the Arctic with huge positive height anomalies across the mid latitudes. Here is the composite for Arctic Oscillation phases and you can see how closely the pattern fits the +AO. Fast forward to 1/7/12 and you can see the huge changes underway in the Arctic. The negative height anomalies over the North Pole are gone and heights are rising thanks to a ridge north of the Caspian Sea across Russia and into the Arctic Ocean. As we move forward the neutral AO state we have presently will become negative with a huge ridge developing over the Aleutians/Bering Strait by 1/15. The height rises over the Aleutians is very impressive with a large omega block developing. Winter lovers rejoice! This will effectively dislodge the polar vortex and the cold from the Arctic and send it south. With little upstream blocking this will not be a prolific snow producing pattern. It will, however, be a chilly pattern and with an active northern stream of the jet stream I expect some snow threats to be around. The question becomes how long does this pattern change stick around? I’m fairly confident a strong +AO will not return. One reason for this is a stratospheric warming event that’s ongoing. Temperatures are beginning to warm in the Arctic stratosphere and zonal wind anomalies are beginning to drop and in some cases reverse. With the Arctic Oscillation on our side I doubt we’ll see a return to the December and early January torch. That said, I’m not sure the Pacific remains favorable for cold. For example the omega block over the Bering strait may retrograde into Kamchatka which will lower heights over Alaska and bring a return to the +EPO. Though this may result in a warmer pattern overall by January 20th without the +AO I doubt it is anywhere near as warm as we’ve been. In addition renewed MJO convection over Indonesia (as forecast by the Euro weeklies) may help skew the pattern warmer over the U.S. by February 1 even with a neutral or negative AO. Bottom line is that winter weather is coming with seasonable to below normal temperatures and some threats for snow. This won’t be an “epic” stretch of winter weather by any means but I do expect more winter than we’ve seen in since Halloween. What’s to be determined is how the pattern shakes out by the end of the month. Will stratospheric warming lead to a sustained -AO? Will a renewed push of MJO convection teleconnect to a warmer pattern overall? Will we see the +EPO vortex return? We shall see! After a seemingly never ending stretch of mild and snowless weather there are signs of a major change to the hemispheric weather pattern by next weekend. The Arctic Oscillation has been strongly positive with a very powerful polar vortex over the North Pole. This has effectively kept cold weather bottled up in northern Canada. The ice cold stratosphere north of the Arctic Circle is beginning to warm and that warming is going to dislodge the polar vortex from the North Pole and bring winter to the United States by 1/16 or so. 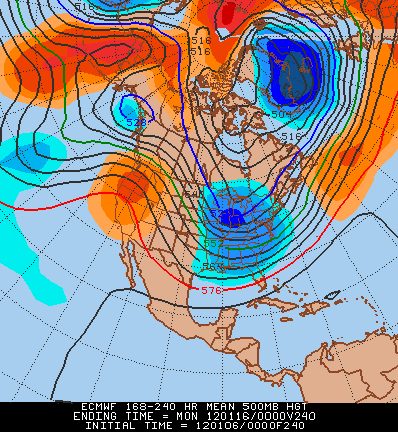 Here’s the 500mb height anomalies on the European computer model for next weekend (day 8-10 ending on 1/16). This is a total change from the pattern we’ve been dealing with since Thanksgiving. The +EPO Alaskan vortex is gone and replaced by a strong ridge over the Bering Strait which is helping to dislodge the PV over the North Pole. In addition a brief +PNA spike with ridging on the west coast helps send cold south. Besides changes in the troposphere the changes in the stratosphere are impressive with a notable warming over the North Pole and disruption of the polar vortex. Here is the 10 day 30mb Euro temperature forecast. Between D0 and D10 there is a nearly +25C warming at 30mb at the North Pole. Definitely a change. Beyond Day 10 the pattern remains chilly for the northeast with the +EPO nowhere to be seen and a -AO. The presence of a -AO has a big impact on temperatures across the U.S.
For people who want snow I don’t think this will be a prolific snow pattern with little upstream blocking (i.e. +NAO) but I do see seasonable to at time below normal temperatures for the second half of January. No question this is a major pattern change across the northern hemisphere. The question I have is how long does this change last – will it stick around through February? I don’t know. If I had to guess I could see two wintry threats one around 1/16 with a clipper-type system and another around 1/21. Will It Stay This Warm? The easy answer is no. Monday was a full +20 above average in the greater Hartford area which is an impressive departure for normal. The month as a whole so far is +3.1 in metro Hartford which is nothing to sneeze at either. To figure out if it will stay this much above average we have to look back and see why it has been so warm. The 500mb height anomalies show substantial negative departures over Alaska and the Pacific Northwest. Ugly if you like cold and snow in New England. This -PNA/+EPO combination is in general a very warm pattern for the northeast. Inversely, across Alaska, this has been a record cold pattern! In addition to the cold vortex that’s been spinning near Alaska the stratosphere has become exceptionally cold over the Arctic. Up in the stratosphere the polar night jet has gone berserk with a powerful polar vortex. This +AO configuration effectively will mean no sustained high latitude blocking for the foreseeable future. We will need some type of stratospheric warming (possible later in the winter – a SSW?) or some other mechanism (like Rossby wave train breaking) to break up this vortex. Until that happens it will be a challenge to get sustained cold and wintry weather in the northeast unless the Pacific cooperates. Here’s an example of what we saw last year from Dec 15, 2010-Jan 30, 2011 with that epic 45 day stretch of weather. You can see the high latitude blocking with an impressive -NAO that brought the record snow into southern New England for nearly 2 months last year. So where do we go from here? Winter lovers will have some reason to rejoice heading into December as it appears our substantially above normal weather pattern will be changing to something more average. Finally we’re beginning to see some improvement in our computer models for those who like snow and cold. Ridging is showing up in the PNA region and some ridging over Alaska to help flip the EPO and bring some cold out of northern Canada. Since we can’t rely on blocking in the North Atlantic seeing changes out in the Pacific are important. Although many of these features appear to be transient this is a reversal from the sustained warmth we’ve been having. We’re getting there. I expect the Day 6-10 (Dec 5-9) and Day 11-15 (Dec 10-14) to average near normal with some transient bouts of below (maybe even much below) normal temperatures. As for snow chances it doesn’t appear like Connecticut will see anything significant through December 10. It’s possible after that point we become a bit more wintry. The good news for skiers is that there may be several snow chances across northern New England over the next 1-2 weeks which, when combined with colder temperatures, should help boosting the base.